A panel discussion with groups campaigning against fossil fool extraction. Wellington Central Baptist Church, 46-48 Boulcott St, Wellington. Each panellist will speak for 15 minutes. There will then be 45 minutes for questions and discussion, followed by time to check out the stalls of groups working on fossil fuel / climate change / climate justice campaigns here in Aotearoa NZ. Tea, coffee, biscuits provided. 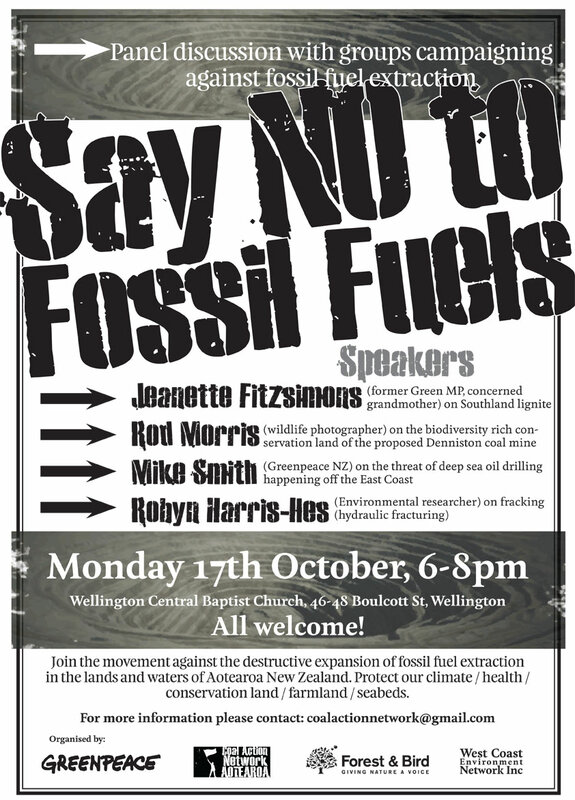 Join the movement against the destructive expansion of fossil fuel extraction in the lands and waters of Aotearoa New Zealand. Protect our climate / health / conservation land / farmland / seabeds. There is a flat entry (no stairs) into Wellington Central Baptist Church via the path to the right of the venue. There is free carparking available across the road at the Wilson Carpark – Just say you are at the meeting at the Wellington Central Baptist Church. (The Church has kindly offered for us to benefit from this arrangement with Wilsons Carpark). Of course, if you can bus / bike / walk etc to get there, great!